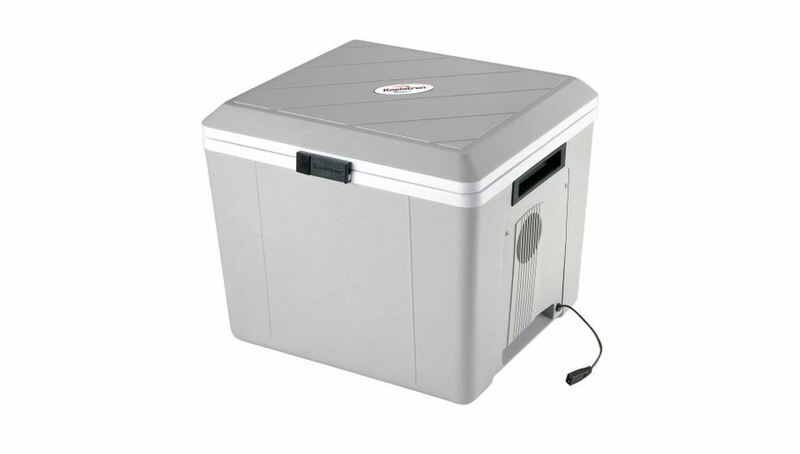 The Koolatron Voyager 29 quart 12V cooler is our top pick for campers, truckers, boat owners and anyone else looking for a portable cooler that doesn’t require ice. The Voyager is technically a thermoelectric cooler. It keeps your food and drinks chilled using an electric heat exchanger, so it requires no ice. As a bonus, the Voyager cooler can also warm your food. The 29-quart capacity is plenty large enough to hold drinks plus a couple of meals for up to 4 people. The cooler is sturdily designed to withstand the rigors of outdoor adventures. It also requires zero maintenance, and you can be sure it will last for years. Keep reading our full review of the Koolatron Voyager 29 qt cooler. If the Voyager cooler is not what you are looking for, check out our other recommendations in our recently-updated portable cooler and electric ice chests buying guide. 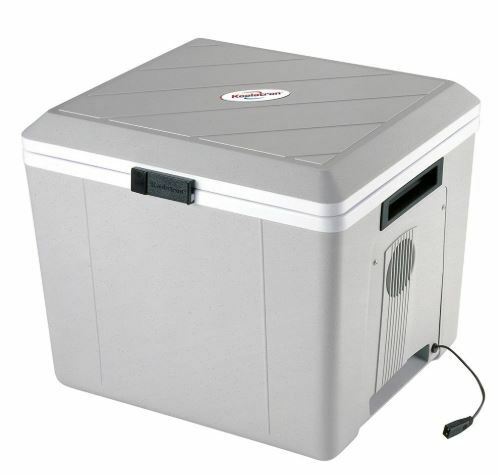 Because it is a thermoelectric cooler, the Koolatron Voyager has several advantages over a traditional ice chest. You don’t need to keep adding ice, for example - so it’s lighter and there is no risk of finding your food all soggy. You don’t have to drain water either. Other than an electric fan, the Voyager has no moving parts. This makes it more durable than a normal powered cooler. Indeed, many users say their Voyager cooler has outlasted all ice coolers they’ve owned by far. Another big advantage of the Voyager thermoelectric cooler is that you can cool and warm your food. Use it to keep your drinks cold when you are on the road and then warm up your dinner or lunch when you reach the picnic or camping site. The warming function is also handy for baby foods and milk. While not as powerful as a compressor-operated mini fridges & freezers, the Voyager keeps your foods and drinks perfectly chilled in just about any weather condition. 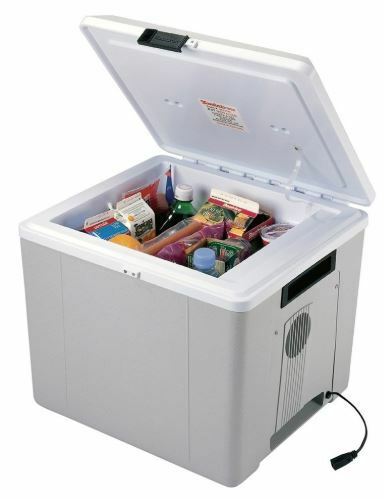 This cooler maintains the interior at a temperature that is up to 40F below ambient temperature. If you are outdoors in 80-degree weather, then your drinks will remain at 40 degrees. In an air-conditioned environment like a car or hotel, the cooler can go even lower. The cooler works best only when you add already-cold or frozen stuff. Don’t put in warm food and expect it to be cold after a few hours. But if you add frozen meat or drinks, they'll stay frozen for up to a few days days - as long as you keep the cooler plugged in most of the time and in an environment less than 72F. As for warming, the cooler can heat your food up to a max temperature of 130F. The 29-quart cooler holds up to 48 12-ounce cans - or 12 cans plus 2 meals for 4. Plenty enough storage for a full day's family outing. The Voyager Cooler comes with a power cord that plugs into your car’s 12V cigarette lighter outlet. This makes it easy to keep your drinks cool on road trips. You can also plug it into any 12V DC outlet in your boat, truck or RV. For camping and picnics, you can power it with any solar generator/batter pack that has a DC outlet. 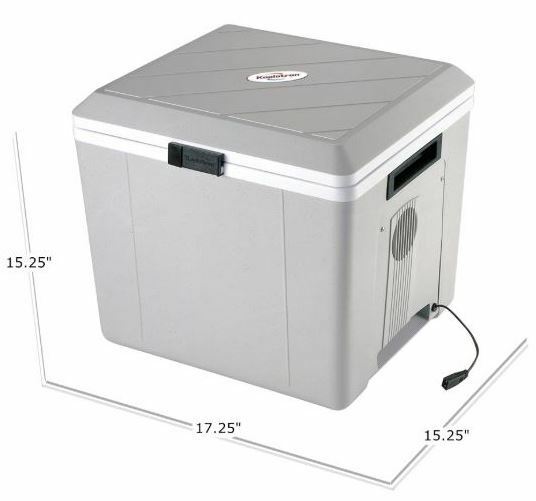 You are looking for a family-sized portable 12V cooler. You want the option of warming food. You want a quiet and reliable unit you can use year after year with no hassles. 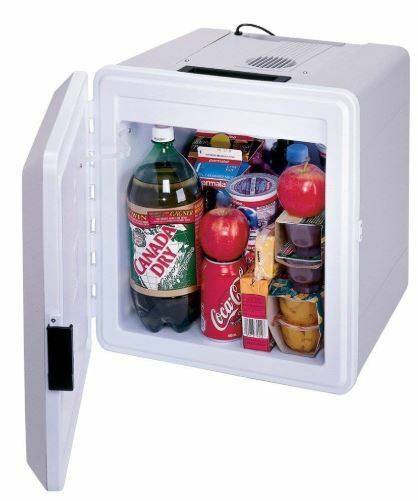 You want a cooler that will freeze warm food and drinks. Get a mini fridge/freezer instead. You want a cooler with variable temperature control. Again, a mini fridge/freezer is what you are looking for. The best place to buy this cooler is on Amazon, where you'll often find the best deal.